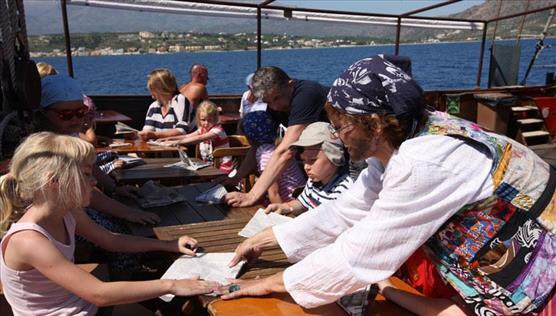 A daily cruise (from 10:00 to 16:45) that will allow you to relax but also trigger the imagination and creativity of your children! Our pirate ship “BLACK PEARL” sets sail almost every morning from the port of Souda for an adventurous trip. When we return in the afternoon, you won’t believe how happy your children are! When you board the ship, our crew will welcome you on board and the animator will encourage your children to search for the pirate flag hidden somewhere on the ship. That way they will explore and get to know the ship, become part of a team and participate in countless activities organised especially for them throughout the entire day. Your children will also be transformed into pirates, make drawings, play games such as swordplay and sack races, try to balance while wearing life-jackets and much more. The winners will be rewarded with special pirate-themed gifts! In the meanwhile, you can enjoy the ship ride, have a drink, listen to relaxing music, have fun with your friends and admire the view of the beautiful beaches. When the ship stops, you can also have a swim in the crystal blue waters of the bay. All these are complemented by a delicious meal in our on-board self-service bar. Our crew, dressed in pirate costumes, will take care of you!